Lieutenant H. Hawes does not like his first name. His friends call him Hawser. He wants to be a pilot but does not make it in pilot school in the military, so he becomes the next best thing: a bombardier. He is assigned to a crew on the B-17 in World War II. After extensive training they fly bombing missions into Germany. The odds are that six out of ten will die doing this job. And when they die, there are no funerals. They just don’t come back. Their bunks are empty and the next day a new soldiers move in. Long before he can complete his 25 missions, after which crew members are sent home, he is shot down over Germany and becomes a prisoner of war. When he thought he has seen the worst of the horror at the hands of the Nazi captors, he is crushed by the realization that even worse atrocities lie before him when he ends up behind enemy lines. I have read a lot of books about World War II. Just recently I re-read King Rat, which plays in a prison camp in the Pacific. Emaciated prisoners live in the tropics, bitten by bugs, suffocated by intense heat, sick with dysentery, abused by the Japanese. At the same time American prisoners like Hawser are kept in camps in Poland, in snow and ice, with arctic winds blowing through the floor board of their huts, where they never get warm enough, where they have to stand at roll call in the snow for hours, some of them without shoes and feet wrapped in rags. Another World War II book about prisoners, in this case women, was A Town Like Alice by Nevil Shute. Five Chimneys – by Olga Lengyel is a harrowing account of life in a Nazi death camp. Just recently I read All the Light we Cannot See – by Anthony Doerr. It illustrates the lives of children growing up in the war in Germany. Then, of course, there is Unbroken – by Laura Hillenbrand, the riveting story of Louie Zamperini, the Olympian who flew in the Pacific and got shot down by the Japanese. Hawser belongs with these books. The author takes us into the B-17 and we fly the missions with them. We feel the cold of the airplane at 30,000 feet and 50 degrees below zero. The lack of oxygen makes us dizzy. And the terror, the absolute terror of knowing that the next cannon bullet from a Nazi fighter could end it all, right there in the freezing sky high above the clouds, paralyzes us and the only thing we can do is become numb and shoot back with a vengeance. We endure eight hours over enemy land, hundreds of minutes of fear, tens of thousands of seconds of despair. The story is reminiscent of the plot of the 1990 movie Memphis Belle. It’s the same plane. If I remember right, there was a scene where the ball (the bubble on the belly of the plane where a gunner was sitting) got jammed, and the landing gear was broken. The gunner could not get out because the ball was jammed, and the belly landing would surely crush him. What to do? There is an identical scene inHawser, which prompted me to wonder how common this situation was in the war. The title of the book does not do it justice. It tells the prospective buyer nothing about what a ride he is in for. But don’t let that deter you. The author has researched the subject meticulously. It feels like he was a B-17 bomber pilot himself, even though that’s unlikely. He knows what life was like in a German prison camp. He knows how the country came apart at the seams in the last few years of the war. He shows us Germany from the inside, and how the Nazi machine not only ruined the lives of all the people it conquered and tortured, but also those of the Germans themselves. 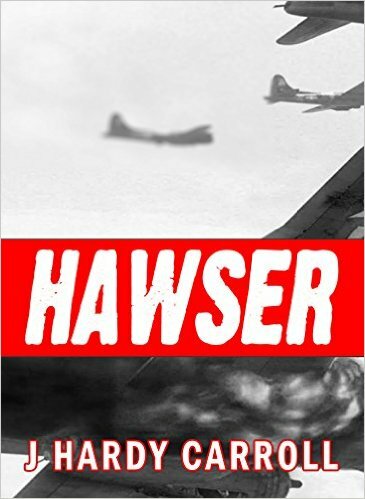 Generations were devastated, and Hawser tells the story about it. After I finished the book, I researched maps of England and Germany and checked out locations. I pulled up diagrams and photographs of the plane. Here are some good shots of the inside of a restored B-17. Stories like this one, playing in Germany in WW II, bring home my ancestry. My father was nine years old in 1945. He hardly knew his father, who was a soldier stationed in Italy. He only came home for a few days of leave every year or so. When the Russians overran Poland and eastern Germany in 1945, they raped women and girls indiscriminately before they killed everyone. To get away, my father, his mother and siblings left their home in Breslau, Silesia as refugees, heading for Bavaria. Had that not happened, my own parents would never have met, and I would not be writing this book review. Hawser brings that time to life. Posted in Hawser, promotion, Reviews. Bookmark the permalink.